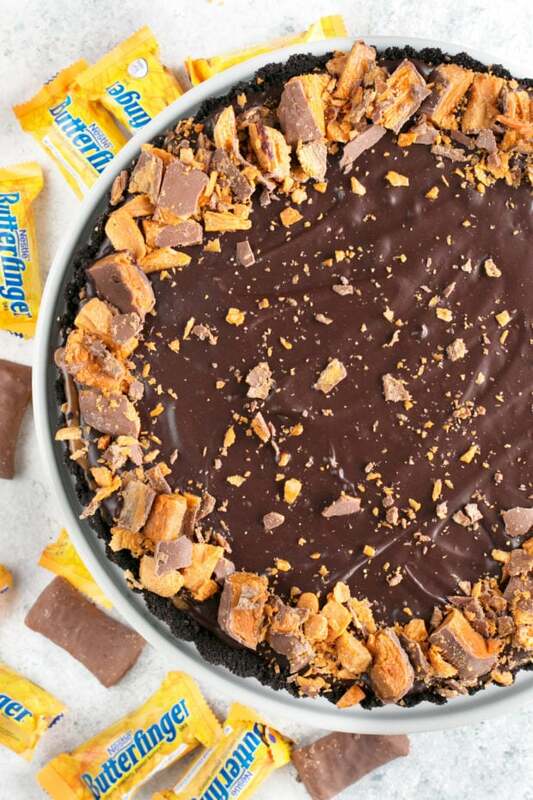 An Easy Butterfinger Caramel Ganache Tart is just the dessert to wow the crowd at your next football party. 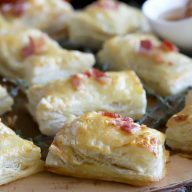 It’s a deceptively simple yet totally drool worth indulgence that’s perfect for pairing with beers or bourbon/whiskey. With only 5 steps, it’s the low maintenance chocolate dessert you’ve been searching for! 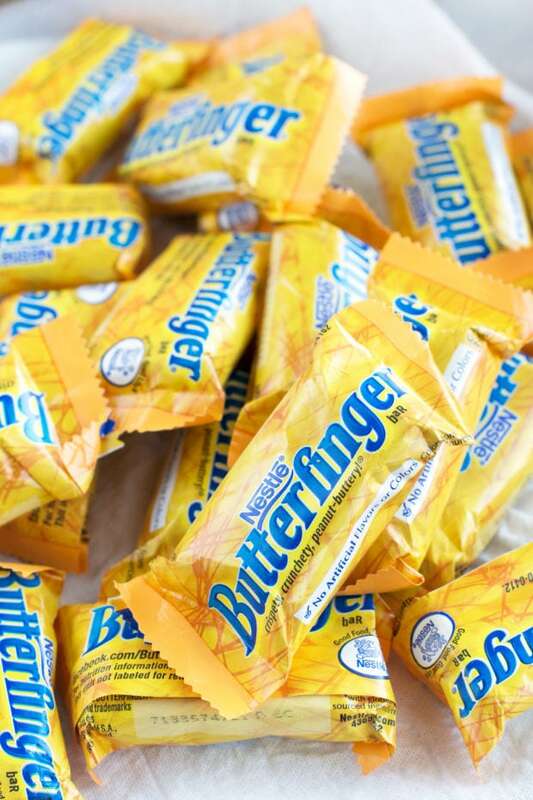 Disclosure: This post has been sponsored by BUTTERFINGER®. All thoughts and opinions are my own. 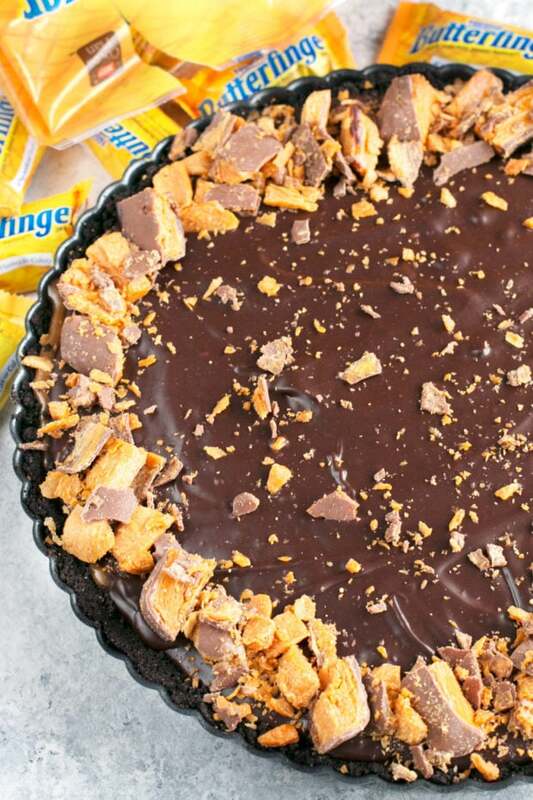 All I can say is, if you love BUTTERFINGER® Candy Bars, you are going to fall out of your chair the moment you take the first bite of this delicious, gooey tart. When I think about watching football (and especially watching the BIG game), I think about all those little savory bites and overly cheesy plates of nachos that I always dive into. As much as I love all things savory, noshing on something heavenly and chocolate-y in the fourth quarter alongside the beer or whiskey I have in hand is just the ticket to getting the final energy to root my favorite team through the end of the game. You might think this gooey tart looks intimidating, but I promise you, it’s SO simple to make. 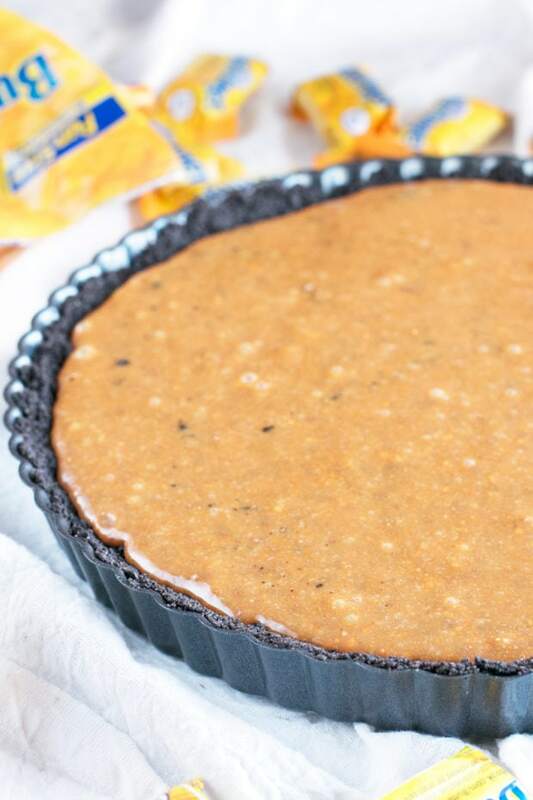 With five simple steps and a simple set of ingredients, this gorgeous, decadent tart is just the crowd pleaser everyone will be drooling over in anticipation of eating it. Chocolate ganache is one of those chocolate indulgences that I LOVE to make. 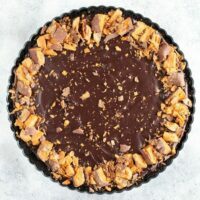 It’s rich and creamy and oh-so decadent – making it perfect for everything from truffles to glazes, and especially this magical BUTTERFINGER® Candy Bar tart! Honestly it’s pretty amazing how simple this chocolate concoction is. It gives you the best flavors of the chocolate, no matter what type of chocolate you are using. 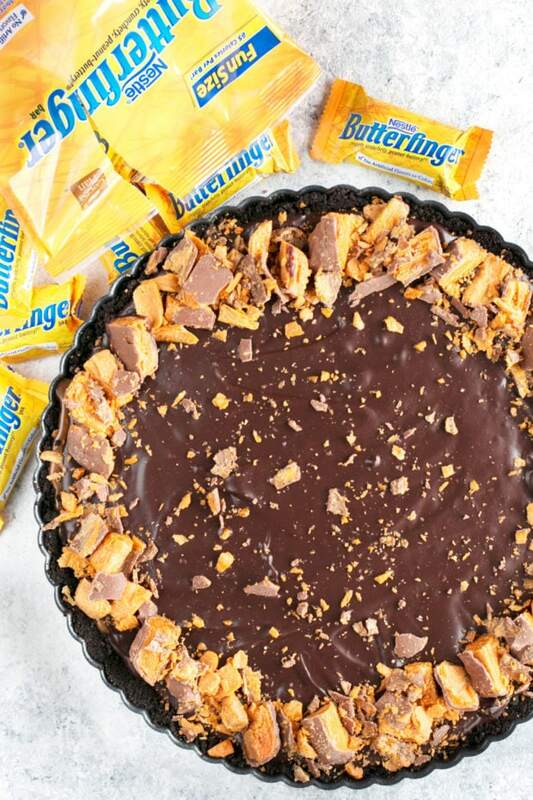 It’s shiny and rich, and it’s the perfect compliment to the amazing BUTTERFINGER® caramel that’s inside this tart. So how do you make ganache? It’s the perfect balance of warm cream and chocolate, allowed to stand and mixed together to just the right consistency. 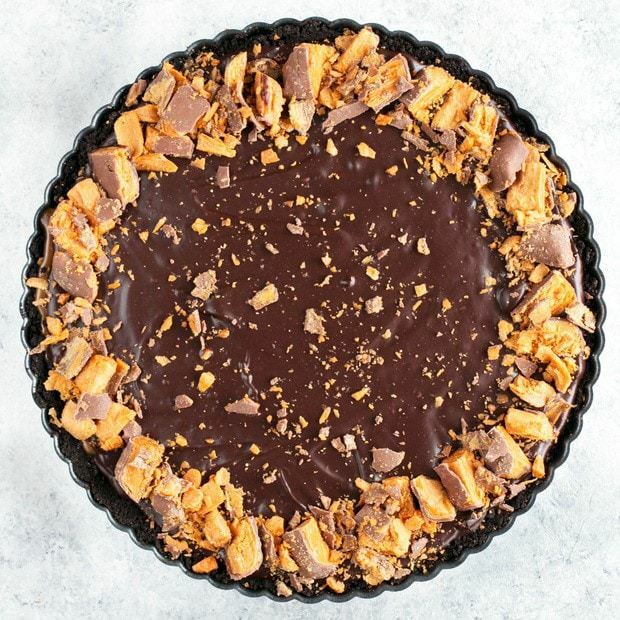 This particular ganache is just the right texture to top the tart, giving it a chocolate-y boost that pairs oh-so well with BUTTERFINGER® Candy Bars. I randomly stumbled upon the combination of BUTTERFINGER® and caramel when I tasted a homemade butterfinger that was topped with caramel. 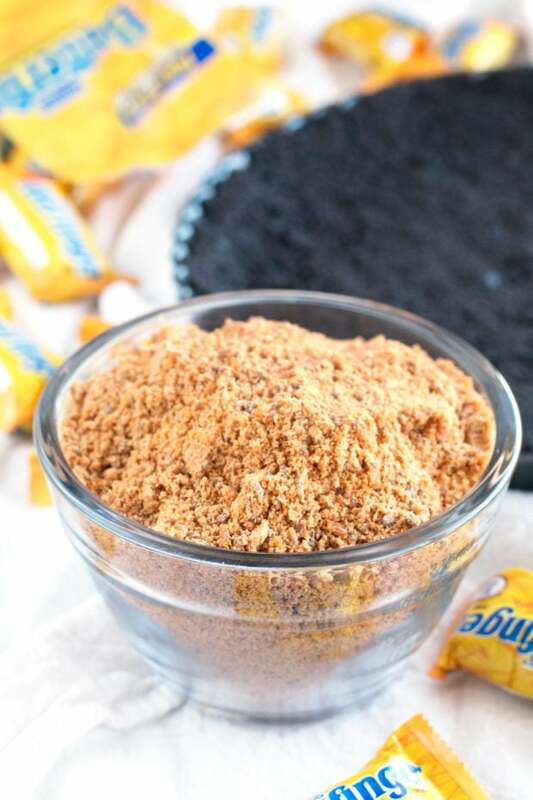 Now while I love homemade things, sometimes you just can’t beat the real thing, and that’s exactly the case with BUTTERFINGER®. So I took things into my own hands and simply chopped up the BUTTERFINGER® candy bars and put them in a rich caramel sauce. 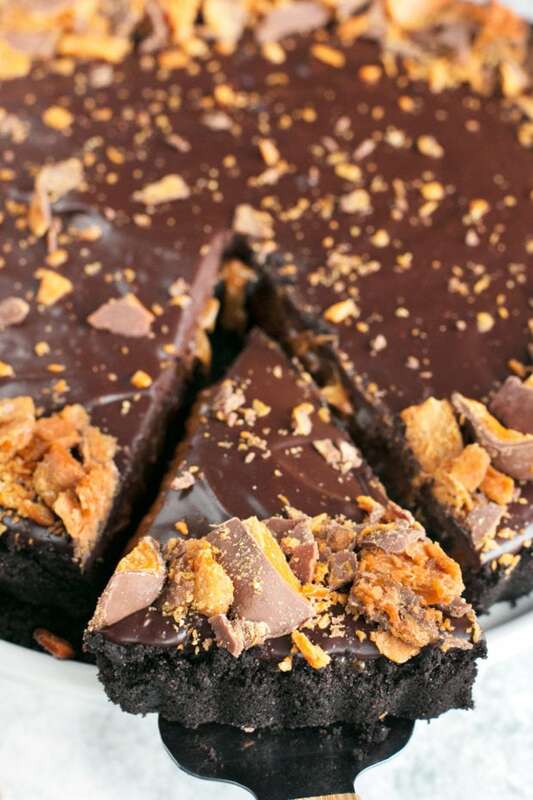 The result is a gooey BUTTERFINGER® combination that is just the right balance – it’s your favorite candy bar on steroids, with a double dose of chocolate (one crunchy from the crust and one smooth and luscious from the ganache). When game day rolls around, you’ve got dessert easily covered with this simple and straightforward recipe! 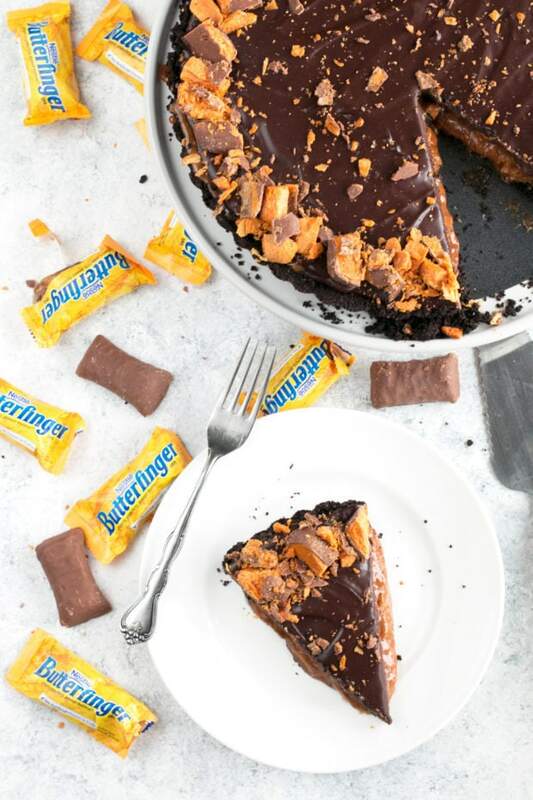 For more delicious recipe ideas and decadent BUTTERFINGER® Candy Bars desserts, be sure to go check out the BUTTERFINGER® Pinterest page! YAS PLEASE. 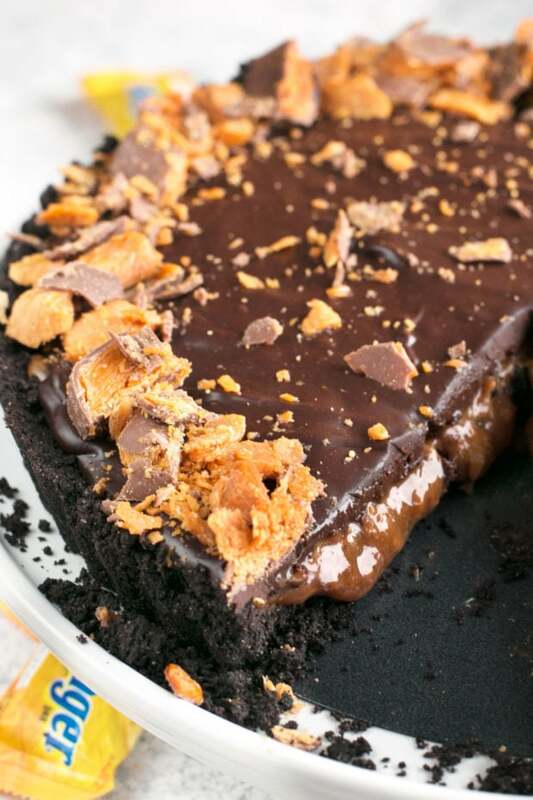 Pin this Easy Butterfinger Caramel Ganache Tart recipe for later! A deceptively simple yet totally drool worth indulgence that’s perfect for pairing with beers or bourbon/whiskey. Preheat oven to 350 degrees F. Pulse ground wafers, melted butter and sugar together in food processor until well combined. Pat the wafer mixture into an 11-inch fluted tart dish, pressing firmly to the bottom and up sides. Bake until fragrant and slightly darkened, approximately 10 minutes. Cool completely. Pulse BUTTERFINGER® Fun Size Candy Bars, then stir into the caramel sauce. I like to slightly warm up the caramel sauce over the stove or in the microwave to make it easier to work with. Pour the caramel into the cooled tart. Refrigerate for at least 3 hours. When ready to add the ganache, bring 1/2 cup heavy cream to a boil in a small saucepan. Add chocolate to a medium bowl and pour the hot cream over the chocolate. Let the mixture sit for one minute before stirring until smooth. 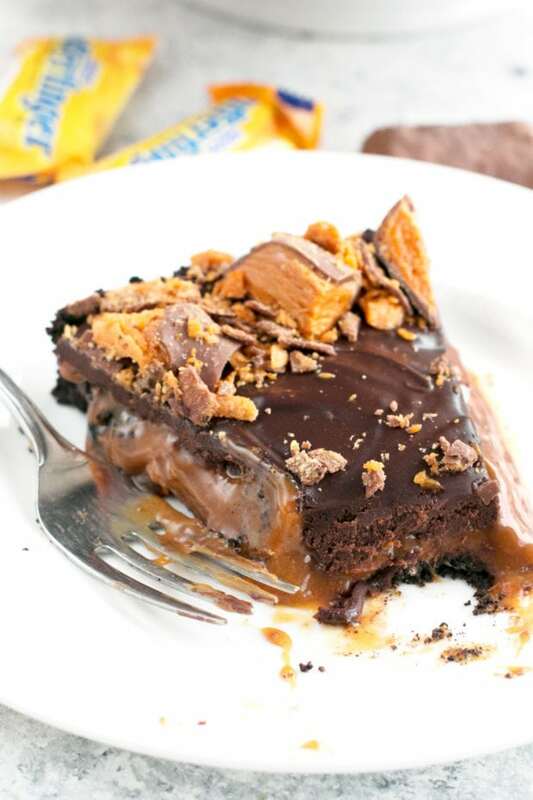 Pour ganache over the hardened caramel and add extra BUTTERFINGER® Fun Size Candy Bars on top in desired design. Refrigerate for one hour. Serve chilled. 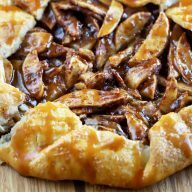 What company did you use for the “thick caramel sauce”? 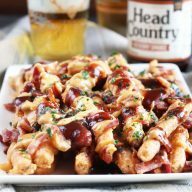 I used Smuckers – you can even use their salted caramel sauce if you want an extra hint of salt!